You asked for it (desserts), you got it (sort of). I love making these muffins. 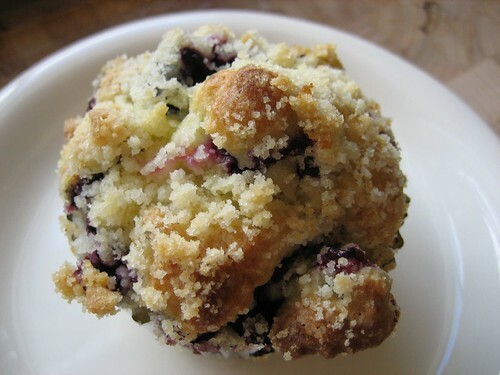 They’re loaded with fresh blueberries, and the crumble mixture on top makes them extra special. Mix the wet into the dry, but only just until it’s combined. If you over mix them, they’ll be too dense (and you want them to be nice and tender). 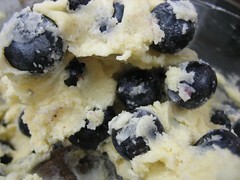 Lastly, fold in 2 cups (my cups are heaping, so it’s more like 2 1/2 cups) fresh blueberries. This recipe says it makes 12 muffins, but I divide the batter into 9 standard sized muffins tins. I like muffins to come up over the tops of their tins to make nice muffin tops. Mix these three ingredients together with your fingers. Really get in there and smudge the cold butter into the flour and sugar. You’re looking for a crumbly consistency. 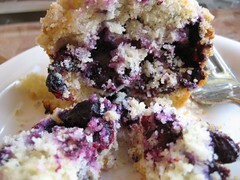 Generously cover the tops of the muffins with the crumble and slid them into a 375 degree over for 30 minutes (check at 20). This recipe comes from our amazing and beloved Gourmet Cookbook. It was a wedding present from one of our closest friends who had the book autographed by Ruth Reichl for us. Needless to say, it was my favorite gift.